Combines the features of Air/Vacuum Valves and Air Release Valves. 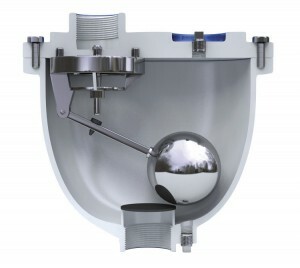 These valves are also called Double Orifice Air Valves. These valves are installed on all high points of a system where it has been determined dual function Air/Vacuum and Air Release Valves are needed to release air and also protect a pipeline from vacuum. Combination Air Valves are available in 2 body styles - 1) single body combination or 2) custom built combination with two bodies. The single body combination is used where compactness is preferred. Generally, it is sound engineering practice to use Combination Air Valves instead of simple purpose Air/ Vacuum Valves.